​What is ICANN Public Comment? When a new Public Comment opens, the ALAC will come to a consensus on determining if the a Statement on this topic is necessary via consultations with subject-matter experts within At-Large on mailing lists, Skype chat groups, and teleconferences of the ALAC, RALOs, and relevant At-Large Working Groups (those will be covered in later sections). If the ALAC, in consultation with the wider At-Large Community, believes that a Statement is necessary, the ALAC works to identify an individual or a group of individuals responsible for writing an initial draft Statement in response to the Public Comment. Those individuals are called penholders. While a penholder can be any member in the wider At-Large Community or even ICANN Policy Staff in support of the ALAC, ALAC Members and Appointees frequently draft Statements due to their knowledge, experience, and leadership role in representing the interests of Internet users within ICANN. Once the initial draft is completed, it is posted to the Wiki workspace -- a web-based platform for collaborative work -- and is open for comment. During that period, the whole At-Large Community is invited to comment on the draft. At-Large members usually provide their inputs using the commenting function in the workspace. Once this internal commenting period ends, penholder(s) consider and incorporate inputs received, finalize the final draft, and post it to the workspace again. Next, the 15 ALAC Members hold a ratification vote to determine whether the final draft should be approved and submitted to the Public Comment as a formal ALAC Policy Advice Statement. This ratification vote is usually conducted electronically via BigPulse, but it can also happen during ALAC’s monthly teleconferences and face-to-face sessions in ICANN meetings. If at least 5 ALAC members cast non-abstaining vote, and if the number of votes in favor of ratifying the Statement is higher than the number of votes against, the Statement will be deemed ratified and submitted to ICANN Public Comment. Due to the interests of time, the ALAC sometimes submits a Statement with ratification pending so that the ALAC policy advice is taken into consideration before the Public Comment period closes. To be sure, the ALAC will not submit a Statement if it is not sufficiently confident that it will reach consensus and pass ratification. ICANN Policy Staff in support of the ALAC usually works with the ALAC to shepherd the policy advice development process, manage the internal timeline, and support community members in using the wiki workspace and the BigPulse poll. 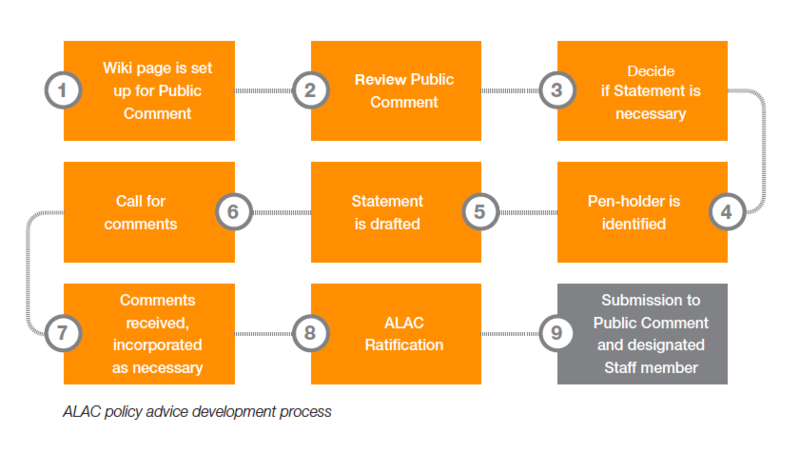 The work pipeline is published on the At-Large Policy Advice Development Page on the wiki, where each Public Comment has its own workspace: https://community.icann.org/x/bwFO. Since 2003, the ALAC has developed and submitted over 300 Policy Advice Statements covering a wide range of topics. You can search and read them here: /policy-summary.